So in my monthly cleaning-out-the-cupboards, I found that we have a lot of jello. And when you have a lot of something, you feel pressure to find a way to use it. Hmmm… are you thinking what I’m thinking? 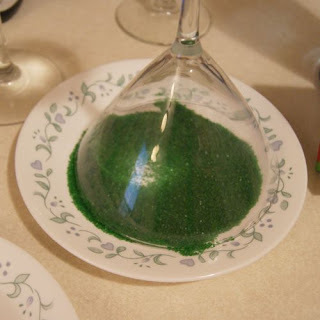 A note – I honestly used one big package of jello, but dividing up my two layers was a *huge* hassle trying to get half to chill and set, while keeping the other half warm enough not to set. Do yourself a favor and just buy two little boxes, or if you have a kitchen scale, measure your large box out to exactly half and half before beginning. 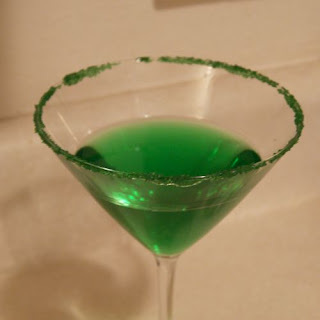 Now, first things first – because this is a spiked dessert, I am garnishing it accordingly. 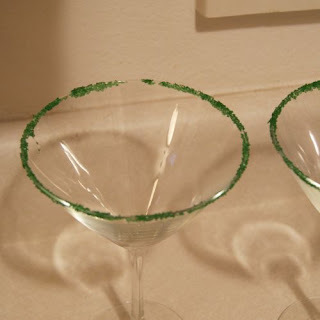 Rim your glass in green sugar. Haven’t done this before? Get two small plates. One one, add a little bit of water. On the other, your sugar. Dip the glass in the water – it will only wet the rim. Then, dip the wet rim in the sugar. Boil 3/4 c. water and dissolve your box of jello in it. Then add 1 c. ice water. Stir until the ice is melted. Now add your 1/4 c. (2 oz.) vodka. In a bowl big enough to accommodate, pour 3/4 cup of your jello mix, and mix it with half the tub of Cool Whip. 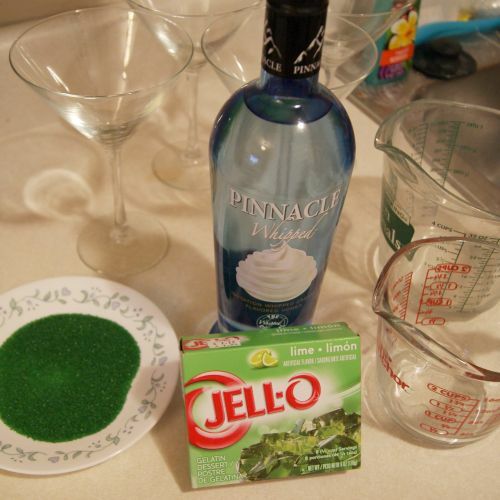 Now, with the remaining jello mix (you should have about 1 – 1/2 cups left), pour equal amounts into your martini glasses. Stick them in the frig to set. Wait impatiently for 15-30 minutes until they begin to set. (Mine took 30 minutes.) Once they are set enough to add a second layer, take them out and divide up half of your cool whip mixture between the 4 glasses. (Reserve the other half for your next layer.) Put them all back in the frig to set for at least another 15 minutes 30 MINUTES, because this is where I had my fail. It seemed set enough in the photo below. The edges were totally set and the middle was only just a little bit wet when I touched it. So I tested one out, adding the jello on top, and it looked great! So I did the rest and put them all back in the frig, only to discover when I checked if the jello was set 30 minutes later – the cool whip layer had come loose and floated up to the top. Doh. A peek at the original photo will confirm, there’s a ring where my cool whip layer almost set in a most spectacularly perfect way. Fortunately, it’s an alcoholic dessert, so I consoled myself by eating one. It was really delicious, so I knew this was a recipe worth pursuing and sharing despite my error. So, back to layering. 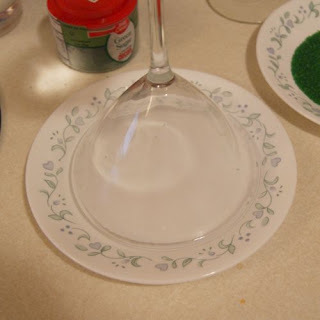 You may also notice my glasses are already fuller than yours – I made some adjustments to how much to pour in for your layers, because when I did it I divided up half and half – for a martini glass, this would make the bottom layer take up much more space that the top layer. So you’ll be using a bit less so that yours comes out more beautiful than mine. You can take this time while you wait to prepare your second box of jello exactly like the first one, waiting the same amount of time between adding your next layers. Chill again, and top with the remaining cool whip mixture. Then let that later set. 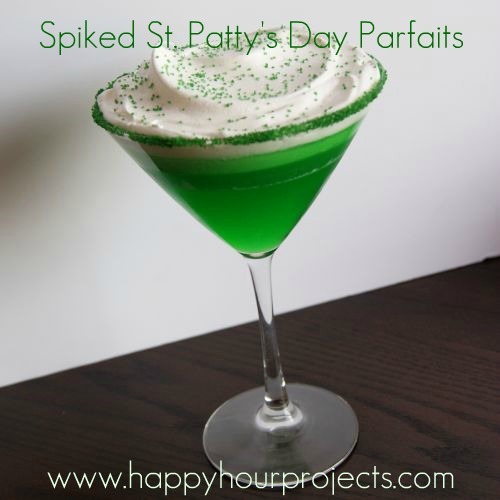 Just before serving, top with some of your remaining cool whip and sprinkle the top with a little green sugar (or garnish with a lime, or a shamrock, or whatever floats your boat)! Remember – each of these has a shot of vodka, so indulge responsibly. ;) Cheers! Wow, I've never had a jello shot but would love to try this one! I told myself, no more jello shots for me.. But you just glorified the term jello shot!! New follower! Stopping by from the Shade Porch blog hop! Love this! Pinning it! This looks so wonderful. 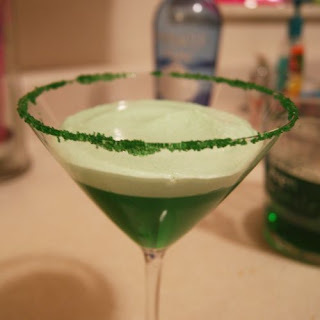 We have a great drink for St. Patrick's Day. Come on over and check it out. We have some great things to share this week. YES PLEASE! I shall start my day with that ! LOL there is booze in it so it was worth it, even if you think they are not perfect. Oh, they turned out so pretty. I love where you said you consoled yourself with the alcohol in one of them, ha ha ha.